It is that time of the year again when weddings are in full swing and festivals one after the other. Dussehra, Diwali, Durga Puja have just passed and now it’s time for Christmas and wedding bells. No wonder, it’s a common sight to see people shopping in the malls, shopping complexes, browsing dresses and other things at online shopping sites like Stylecaret, Amazon or Flipkart. Since India is a country that is known for its culture and tradition, most of the women prefer to wear clothes that are more related or close to their culture rather than being outright western. 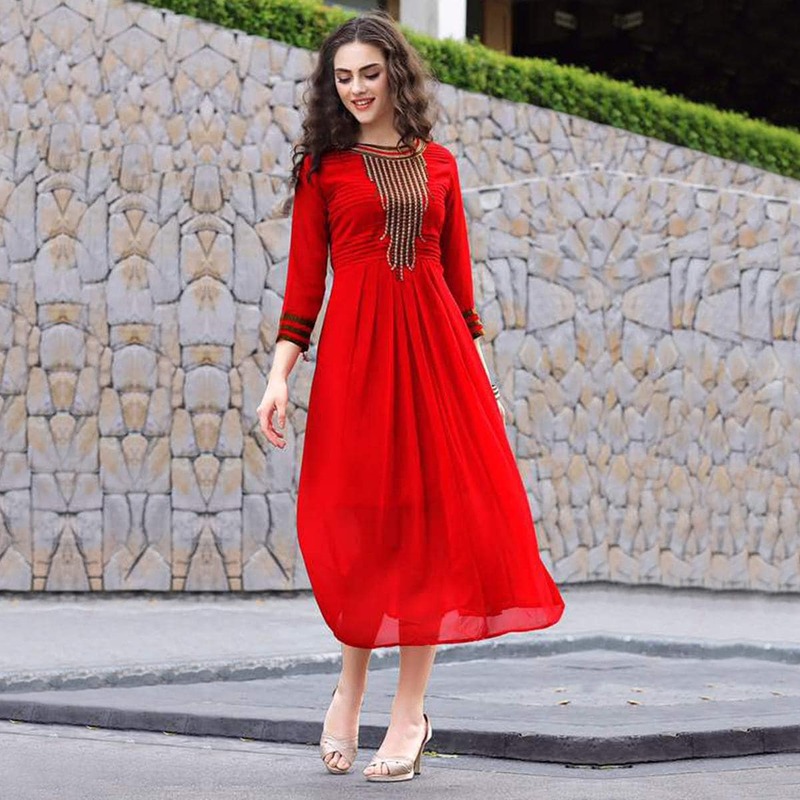 Coming to traditional Indian dresses, there are a lot of options but one dress that stands out among all and is preferred by women of all age groups is the kurti. Everyone, from an adolescent to a teenager to a lady can wear it. It is so because kurtis are not only easy to wear and handle but they are equally vibrant and fashionable as well. Quite naturally, they are found in hundreds of shops and online stores in different designs and colors. One of the major advantages of having a kurti in your closet is that it can be worn anytime, anywhere. Whether it is a formal occasion or casual outing, a kurti fits every occasion. And the best part is it matches perfectly with a pair of jeans or leggings, giving you a total modern vibe. Which kurti is in fashion these days? Different people have different preferences and it is not possible to pin point any one kurti that is in fashion these days, but if one goes by the survey of the people and the shopkeepers, the one kurti that stands out is the designer kurti. 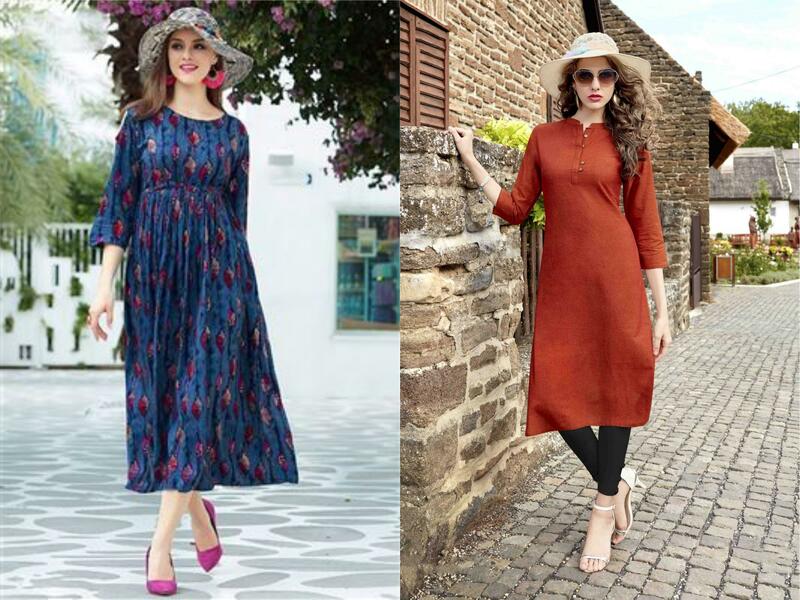 A large number of designers out there in the world means there are a large number of Kurtis with varying design so that everyone’s choice and the taste is matched. The main variation in the design of the Kurtis comes in necklines. The design of the neck can decide which type of kurti you can wear to what type of occasion, for example, a kurti that has a V shape neckline are often considered as a great option when there is a meeting or for official work and on the other hand, a kurti with a closed neck or bandh gala as it is popularly called is a perfect dress for festivals and functions. Is kurti just popular only in India or it has a global appeal too? Kurti is one Indian outfit that popular all over the world. The comfort of wearing, the ease of carrying, the variety in designs, styles and colors and finally its stylish vibe makes it a truly global outfit. And as Indian fashion industry with some of its finest designers as well as models is slowly making a name for itself in the world, the kurti along with other ethnic dresses is becoming a style statement among women across the world. The versatality of this garment adds smartness, brightens look, and gives a reason to wear something new everyday. How to pick the perfect kurti? If you are deciding to buy a kurti this season, make sure you check online sites like Stylecaret first not just to get a hang on the latest designs but also to get an idea of the price before you go out to the mall or market for buying one. The first thing to look for while buying any clothing is the fabric it is made up of and if you are comfortable wearing it. Kurti is something that you can wear on any day of the year, so it surely should be made up of such fabric that you are comfortable with. One should usually prefer cotton as it can be worn year round and is also practically safer in the sense that it and does not cause any allergy or other health issue. Cotton fabric is soft on the skin and does not shrink as well. There are many cheap clothing materials in the market today that apparently look and feel like cotton but shrink to sizes smaller when washed. Make sure you confirm from the shopkeeper that’s not the case. Once you have zeroed down on the material, check if the finishing is done properly and the stitching is proper. An improper finishing will make the kurti look cheap and ill fitted. Also, the bad stitching will come off eventually making you invest extra money. The next step is to get the proper size of the kurti. Each woman, girl is shaped differently and are kurti designs are categorized accordingly. Make sure you are buying the right size. If possible, try it once in the trial room so that you can see if it fits you properly or some alteration is needed. These are just some of the things that are related to kurti. It is an all-time and all-season wear clothing and that is why it appeals most to today’s generation. Most of them are looking to buy something that helps them on the festivals as well as in day to day life. Heavy embroidery clothing is suited for special occasions only and cannot be worn every day which is not the case with kurti.